This holiday is pretty self-explanatory. Very little direction is needed. If you don’t have a mate, perhaps you can borrow someone else’s. Just be sure to ask first and maybe offer a bit of an explanation in case they forgot to put Kiss Your Mate Day on their own calendar. I had no idea that so many people like blueberry pie and was surprised to find out that blueberry pie is one of the most popular pie flavors in the United States. Maine produces 25% of all low bush blueberries in North America, which makes New England the largest producer of blueberries in the world. An El Morno friend shared that Mrs. Smith makes a really good frozen blueberry pie. I thought I would share this tip in case you were not planning on making a blueberry pie from scratch. ♥~ 1973- The Dark Side of the Moon, by Pink Floyd, topped the U.S. album chart for one week before settling in to become the longest-running U.S. chart album of all time. Though it was only number one the first week, The Dark Side of the Moon stayed on the chart for 741 weeks. ♥~ 1985- The little town of Parker, TX, not far from Dallas, reported a 2-to-1 edge in the ratio of tourists to residents. The small town was visited by 2,100 tourists each day as they flocked to Parker to visit Southfork Ranch, the home of the Ewing family (CBS-TV hit, Dallas). ♥~1994- Northwestern University announced that the so-called biological clock, that gene governing the daily cycle of waking and sleeping called the circadian rhythm, had been found in mice. Never before pinpointed in a mammal, the biological clock gene was found on mouse chromosome 5. ♥~ kiss (v.) O.E. cyssan “to kiss,” from P.Gmc. *kussijanan (cf. O.S. kussian, O.N. kyssa, O.Fris. kessa, M.Du. cussen, Du., O.H.G. kussen, Ger. küssen, Norw., Dan. kysse, Swed. kyssa), from *kuss-, probably ultimately imitative of the sound. ♥~ The science of kissing is called philematology. ♥~ Lips are 100 times more sensitive than the tips of the fingers. ♥~ Approximately two-thirds of people tip their head to the right when they kiss. Some scholars speculate this preference starts in the womb. ♥~ On July 5-6, 2005 a couple in London locked lips for 31 hours, 30 minutes, and 30 seconds, making it the longest kiss ever recorded. ♥~ Kissing is good for teeth. The anticipation of a kiss increases the flow of saliva to the mouth, giving the teeth a plaque-dispersing bath. ♥~ The first on-screen kiss was shot in 1896 by the Edison Company. Titled The May Irwin-John C. Rice Kiss, the film was 30 seconds long and consisted entirely of a man and a woman kissing close up. ♥~ Polls consistently list the kiss between Ingrid Bergman and Cary Grant in the 1946 film Notorious as one of the sexiest kisses in cinematic history. Because the Hays Code allowed on-screen kisses to last only a few seconds, Alfred Hitchcock directed Bergman and Grant to repeatedly kiss briefly while Grant was answering a telephone call. The kiss seems to go on and on but was never longer than a few seconds. It’s a rainy, blustery Saturday in Chicago. Cole and I just returned from breakfast, and I suggested he figure out a way to move the entertainment center off the front porch and into the alley. He suggested we use it as a mailbox. We are in negotiations. Cole’s birthday shoes arrived. I love the way his size 13 feet make my feet look small. My side of the family is known for having huge feet (we call it “Murphy Foot”). Legend has it that a Murphy baby can be identified by foot size alone in a hospital nursery. My boy is 6 feet tall, and I’m not sure how much more he will grow, but can you imagine how tall he would be if he did not have so much turned under for foot? Odd Loves Company, so leave a comment if you have an El Morno moment! Wonderful Saturday. Heading out to play golf–maybe I will give the gal in the pro shop a kiss for luck. Not a fan of blueberry anything. Well inquiring minds want to know..did you get your kiss? Beautiful Azalea bush. What kind of camera are you trying out now? I love blueberries might have to pay Mrs. Smith a visit! Thanks Geri. It’s called a Lytro. Fun but a learning curve for sure…a whole new way of taking pictures. Look at the boys shoes. I love them! But your right his feet are huge. The entertainment center could be handy for packages. We thought about the package advantage! It could be very handy around Christmas. Those shoes are very cool and his big feet really show them off to there fullest potential. Dinner with my mate! Might kiss him again if he’s lucky. “His big feet really shows them off…” What a way with words you have! Yes Mints or Crest before kissing! Everybody in my family (including the Sheltie!) loves blueberry pie! The Sheltie, especially, looks real cute with a purple/blue mouth. I never missed seeing Dallas — used to live in Texas, you know, not far from Parker, though I never saw the Ewing’s home in person. Cole wears a size 13? Mercy, he’s got Domer beat — he only wears a 10, though he’s at least as tall!! I said it down below in a comment but I have a client that feeds her pup blueberries and yogurt every morning–pups loves it and looks great. I loved Dallas. What a great shoe. Cole just has big feet, it runs in our family and insults are tossed both ways. My dad will say we don’t need skies…my mom will tell him she could put both her feet in his mouth and still have room to walk around. Fun and Feet! oh, geeeez, now I have to go get a blueberry pie..that photo of one looks scrumpsious !! Thanks. The Azeala bush is about the only thing I have grown that produced a flower. MMM–you don’t want to do shoes?? Interesting idea! I am redoing my bedroom so I like that idea! 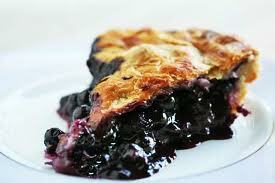 I LOVE Blueberry pie 2nd best. My first is Banana Cream Pie. Kissed Millie today. Her 9th Birthday is Monday. Will give her an extra puppy cookie. Your azalea bush is so pretty. I use to have one. And you know what they say about big feet!!!! Bye Bye. I guess a lot of people love blueberries. I like them in a bowl with cream. I have a client who gives her Carin terrier (Max) blueberries and yogurt mixed into his food every morning. It’s suppose to be very good for them but work up to it slowly to avoid stomach upsets.